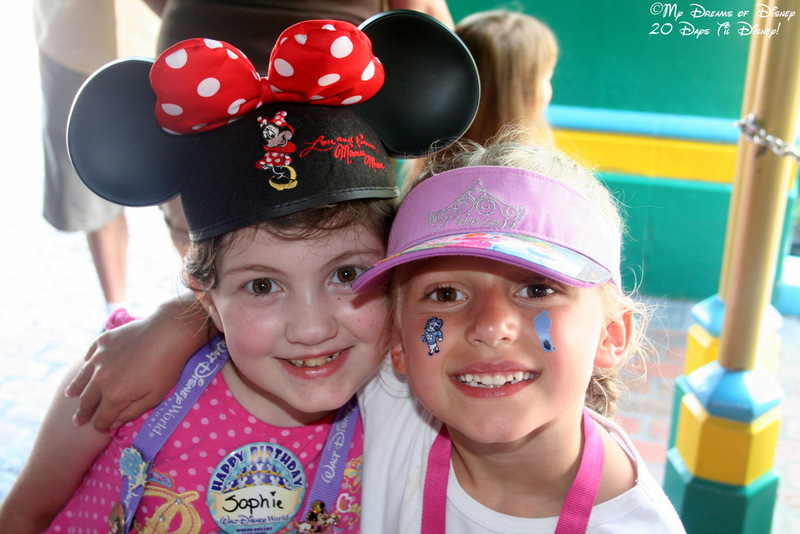 Sophie’s 7th Birthday – 20 Days Til Disney! Today’s picture takes us back to June 19, 2008, when a special little girl named Sophie was celebrating her 7th birthday. On that day, we were fortunate enough to be able to invite her BFF Riley to hang out with us for the day at the Magic Kingdom. This picture was taken while in line to ride The Many Adventures of Winnie the Pooh ride. Although Riley would only visit with us at the park that one day, we had a great time and some really great memories that continue to this day! I wanted to take the time right now and thank each and every one of you for entering into our little anniversary contest! I have had a lot of fun chatting with all of you tonight, it has been great! In our contest, we ended up with1,028 entries, with the winning entry being Krystin Wynter Angelucci! Krystin has 24 hours to send me her shipping information, and the Sorcerer Mickey Lithograph will be sent directly to her! If I don’t here back from her in the 24 hour window, which expires Friday night, September 9, 2011, at 10:00 PM EDT, I will choose a second winner. Thanks to everyone who entered into the contest on Facebook, Twitter, and all of the other entry points! I have been blown away that you all have taken time to read my Disney posts! Thanks!